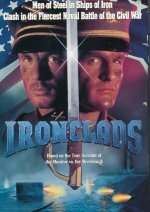 A television movie recreating the Civil War confrontation between the warships "Monitor" and "Merrimack." A woman helps a Union soldier infiltrate the Confederate Army and learn important secrets regarding the firepower of the "Merrimack" for the designer of the rival battleship. As TV-company-productions go, this movie is very good. Right on the heels of the excellent "North And South" mini-series, it's production and shots and atmosphere are almost matching. Story-line and plot development are very good, and the battle-scenes between the ships are well-planned and edited. The models for the ships are probably very large, reminiscent of the excellent British "large-tank" ship-filming of the 60's. If you're keeping a copy of "North And South", this would be your "bonus-disc".